I love the idea of doing all my shopping at the little shops that are close by to me here in London. I’m really lucky to have a butcher and fishmonger, a street market and terrific greengrocer all within walking distance. But the pressures of modern life and the unwillingness of said purveyors to stay open to suit my erratic life, mean that I am often forced to shop in supermarkets. And I don’t mind them…they get a bit of a raw deal from the food-nazis. Some of what they do is good, some not so good but can I imagine a world without them? Not really. What I does annoy me is how difficult it is to shop as a single person in a supermarket. The packaging generally encourages over-buying and general waste. I’ve become expert at decanting chicken thighs, sausages, mince and other perishables into their own little zip lock bags to stash in the freezer. Unfortunately I’m not so nifty with the Sharpie so hidden at the back of the freezer I do often find a random protein pouch of somewhat indeterminate nature. But what’s life without a few surprises….and I must be Lakeland’s best StayFresh Bag customer ever. (More of those later. They deserve their own posting if not their own blog). Of course, the solution is to buy from the meat or fish counters in the exact quantity I want. But here’s today’s confession. More often than not I still buy too much. Why? Because I hate that the guy behind the counter might think that I’m a lonely widow (or worse spinster) heading home to eat my sad little (sustainable) cod fillet in front of the telly as I feed the leftovers to my cat. ( I don’t have a cat). Such is my ridiculous need to still be seen as part of a couple, often as not, I will come away with enough for two people and either throw what I don’t eat away, munch the same thing two days in a row or worst of all, scoff enough for two and then feel utterly miserable. 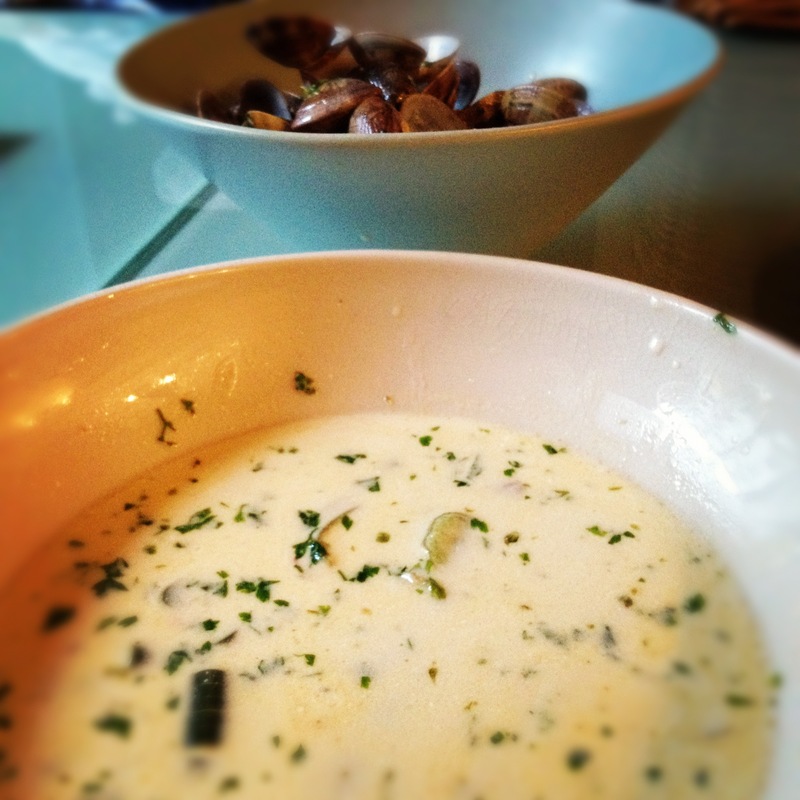 I much prefer clams to mussels. They are a bit more expensive but their sweetness and firmness is in direct contrast to the sometimes spongy and bitter notes you get with mussels. 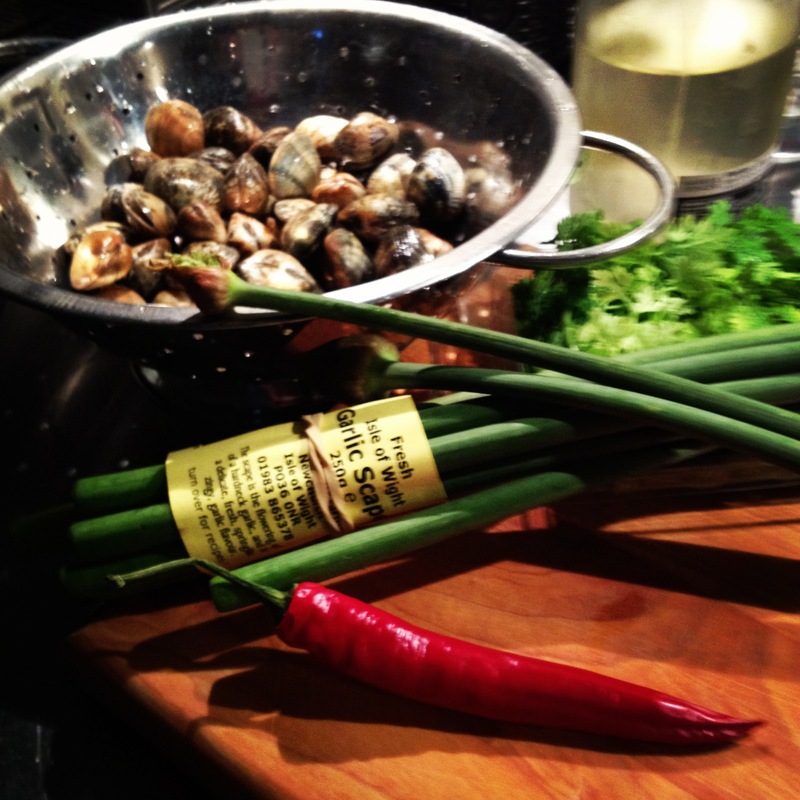 Clams almost never disappoint.And now that I think about it, I suppose that’s partly why I love clams (and mussels at a push) so much: The fishmonger has no way of knowing if I am making a starter for two or a main course for one! 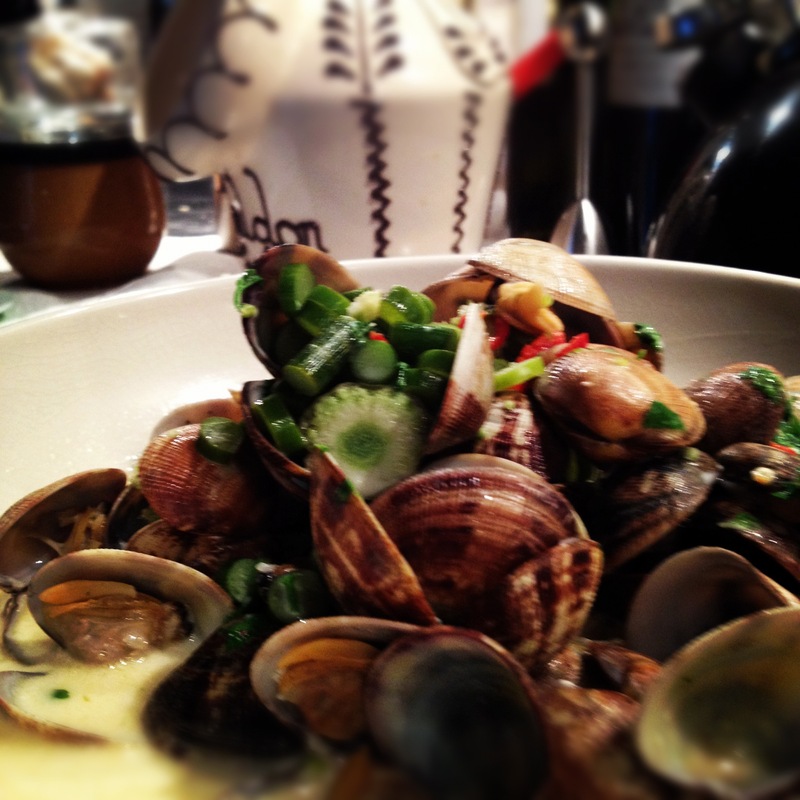 Clams from this day forward should be known as the molluscs that keep your dignity in tact. And I love that. Heat a little olive oil in a heavy based pan. As you’re doing this, give the clams a wash and throw away any that are already open and don’t close after a gentle tap. Chop the garlic scapes into the thickness of a 2p coin and finely chop the chili. Throw into the pan and let soften for a minute or two. Do not allow to colour. Throw in the clams and the white wine. Bring to a simmer and cover for 2 minutes. 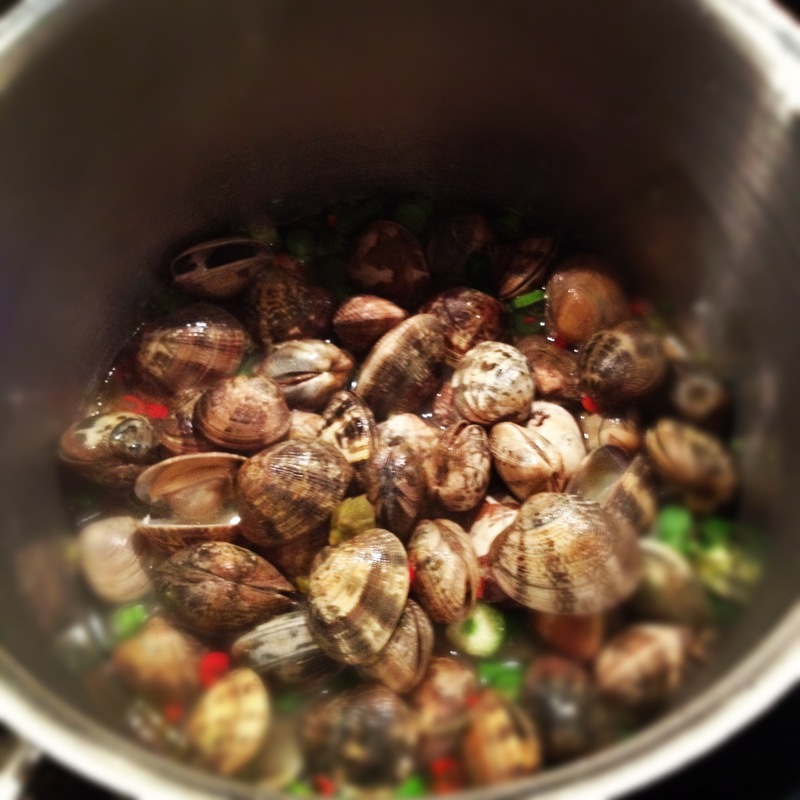 Using a slotted spoon, put the now open clams into a warmed bowl and put the liquor back on the heat. Have a taste to make sure the alcohol has evaporated. If it hasn’t bring back to a boil for a minute. Add the cream, a grind of black pepper and the shopped chervil. Pour over the clams and serve. The garlic scapes are a triumph. My new favourite vegetables.They have the texture of al dente asparagus with the flavour of sweet garlic. They added the most delicious crunch to the soup left in the bowl. But if you can’t get them, use a bit of leek. Gorgeous. I used garlic scapes to make a risotto. It was lush.